The Kingdom Hearts franchise has a wonderfully captivating premise: it’s a mash-up of the Disney film catalog and the Final Fantasy gaming universe, letting you embark on charming quests across worlds inspired by everything from Aladdin to The Little Mermaid to Tron. The only problem is that it has become nigh-impossible to follow. After the first two PlayStation 2 entries from more than a decade ago, the series splintered into an array of spin-offs with oft-incomprehensible titles (like Kingdom Hearts 358/2 Days) and even more convoluted plot points. And now you can play the series on your iPhone or iPad with Kingdom Hearts Union χ[Cross], another game with a quirky title. Does it at least have a clearer narrative arc? No, not really—but if you’re looking for a mindless role-playing romp through an array of Disney-themed environments, then this time-killer might suffice. 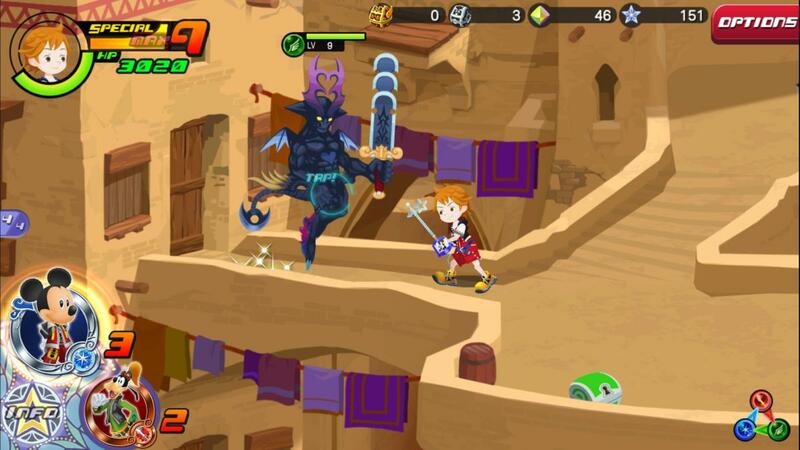 Conceptually, Kingdom Hearts Union χ[Cross] doesn’t deviate from what we’ve seen in the various console and handheld entries: it’s a combat-centric game that finds your hero tossed into an array of Disney lands, with environments inspired by the likes of Alice in Wonderland, Snow White and the Seven Dwarves, Aladdin, Hercules, and Winnie the Pooh in this one. And you get more than just the familiar backdrop, too, as each land brings some of its famous characters along for the ride. Funny, I don’t remember the Heartless floating around in Aladdin. As ever, you’ll also battle against the Heartless: dark, anthropomorphic creatures that lack emotion and aim to consume hearts. And you’ll do so by wielding the Keyblade, a massive key-shaped sword used to beat the stuffing out of those grim-yet-cartoonish beings. The combat has been dramatically simplified here, however, as the game takes place entirely in 2D worlds (rather than from a 3D, behind-the-back perspective) and you’ll simply tap and swipe to attack. Each mission typically lasts only a couple of minutes as you run up to the next Heartless monster hanging around, slash it to bits, and then repeat until the main target is defeated. Although the terrain may change, the tactics barely do—and the action quickly turns tedious. Even if you change to a different type of keyblade or swap out the medals that define its attributes and attacks, it all tends to feel the same. The story mode parcels out little bits of narrative over time, but it’s been very thin in the few dozen missions I’ve been through—although there’s tons still ahead, with several hundred of the bite-sized missions available. There are also special and event missions available outside the story mode, although these are mostly targeted at higher-level players who have logged a ton of time and have powerful heroes. And then the titular Union Cross mode adds a multiplayer twist to the action, letting you team with up to five other players to take down massive Heartless Raid Bosses. They’re tough, though, so you might get pummeled if you’re a low-level player—but your allies can also lend a hand and potentially carry you through the challenge. I suppose the biggest catch with Kingdom Hearts Union χ[Cross] is about the same as a lot of streamlined mobile role-playing or strategy games: there’s a lot of minutia in menus that is either unclear or just so convoluted that you might just ignore it entirely. Or you might be compelled to spend money to look for a quick fix. Neither is a great option. You’ll have to figure out which medals are best for your hero to equip. Union χ[Cross] is monetized through a currency called jewels, and you’ll actually pick up a fair number of them just by logging in and playing the game. However, you might be tempted to buy big bundles of them thanks to the frequent medal promotions. 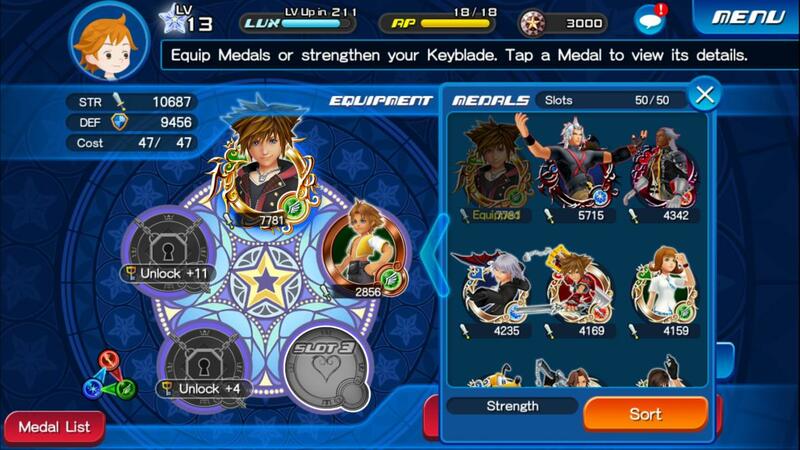 Medals let you equip your keyblade with attacks inspired by various Disney, Kingdom Hearts, and Final Fantasy characters, plus you can scrap unneeded medals to power up your favored medals. The big promotions offer the possibility of drawing a rare, special medal, but it’s also possible that you’ll spend your 3,000 jewels and not pull that unique medal. It’s a crapshoot, and a pricey one at that: you would have to spend more than $25 in real cash to buy that many jewels under normal prices. However, there is a recurring “deal” that grants you 3,000 jewels for $15, along with access to special quests until the next week begins. Die-hard players see it as something of a weekly “subscription fee”—an optional and very expensive fee, at that. This could be a very pricey habit for heavy players. 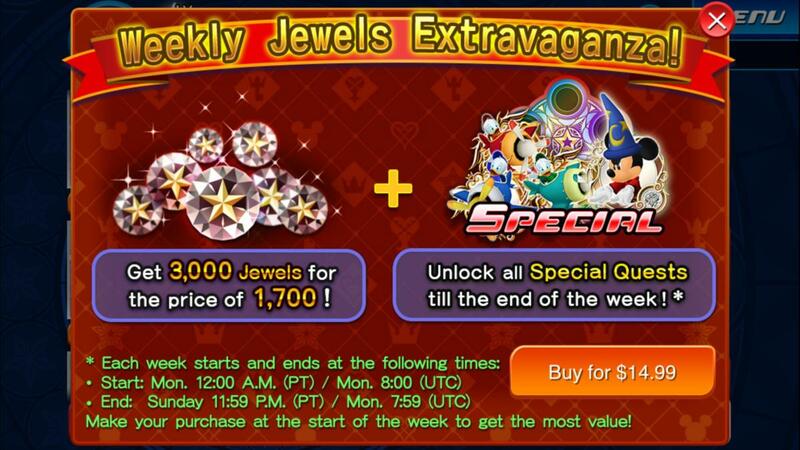 In any case, you’ll get a steady stream of jewels just for logging in any playing daily, so spending that much money to do a random medal draw seems highly unnecessary. Also, Union χ[Cross] does have an energy system, and at least early on, it hasn’t been very painful at all. You’ll have enough AP (energy) to finish at least three successive missions, typically, and you’ll still level up frequently enough to have your meter automatically filled—so even during longer play sessions, I’ve never run out of AP. That’s more of an issue later on, though, as level upgrades become few and far between and some deeper missions cost more AP to play. Just be forewarned: if you get deep into the game, you may eventually feel pressured to spend money to top off instead of waiting for your AP meter to refill. 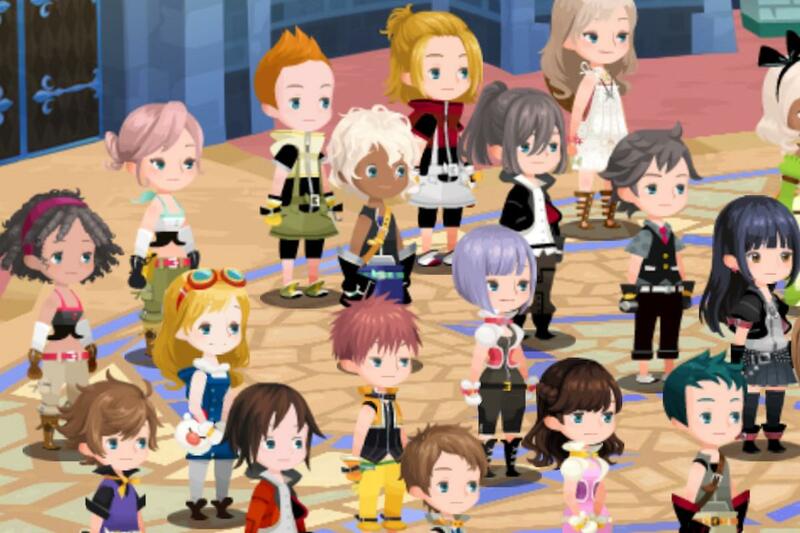 Kingdom Hearts Union χ[Cross]’s biggest sin has nothing to do with its freemium model—it’s simply too dumbed down to maintain much interest. The routine of tapping and swiping to smash through common enemies turns tiresome almost immediately, and the game gives zero indication that there’s any more complexity or significant variety later on. And yet it’s a solid enough diversion. 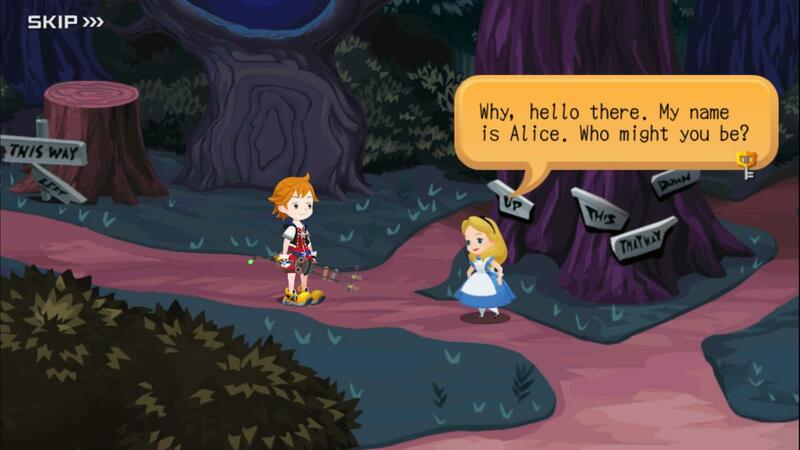 It hardly seems critical to the Kingdom Hearts lore, even if it does serve as a prequel to the entire series, but that’s great news for anyone who isn’t already invested in Disney and Square Enix’s series: you can largely ignore the dialogue and just appreciate the unique pairing of fantasy characters with Disney creations. That’ll be enough of a lure to pull some players in for a few minutes a day, even if the actual interactions prove to be laboriously dull.